In these times of great social change and a rapidly-shifting baseline for how cinema attempts to position itself in the world, Darkest Hour is comfortingly reactionary bit of nothing. I don't in anyway refer to its content, though that is too; I'm simply referring to how very much this feels like something that somebody might have made in the late '90s to win Oscars, instead of the late 2010s (where it was also, transparently, angling to win Oscars). It's a perfect example of the ancient film industry precept that the way to be successful is to closely mimic success; in this case, Darkest Hour is an adorably transparent attempt by writer Anthony McCarten to copy the narrative structure of 2010's Best Picture winner The King's Speech, with Winston Churchill instead of King George VI. Which is such a small change that, in this film, the scene of Colin Firth's George VI receiving advice about being a public speaker from Timothy Spall's Churchill has been replaced by Gary Oldman's Churchill receiving advice about being a public servant from Ben Mendelsohn's George VI. 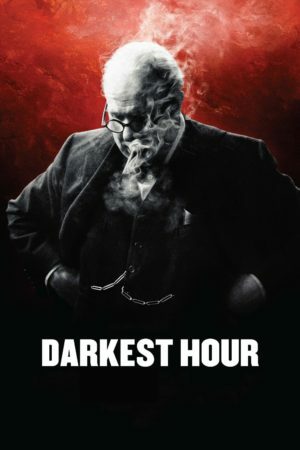 Darkest Hour is the much more compact film; like the two other 2017 films it substantially overlaps with, Churchill (starring Brian Cox as the prime minister) and Dunkirk (which does not feature him, but takes place at literally the exact same time as Darkest Hour, and ends with the exact same speech), this takes one heavily delimited period in the history of the Second World War and examines how people dealt with it. Specifically, it's May 1940, and people are absolutely done with Prime Minister Neville Chamberlain's (Ronald Pickup) habit of rolling over for the Germans in the hopes of a peace that stubbornly refuses to manifest. Hoping to avoid a crisis, Chamberlain quickly accedes to Parliament's demand for his resignation, proposing that Edward Wood, Viscount Halifax (Stephen Dillane) take his place. When Halifax protests his inability to meet the demands of the position, Chamberlain turns to the only other man who will be acceptable to the three parties holding power in the government: Winston Churchill, First Lord of the Admiralty. This immediately causes headaches for everybody: Churchill has an aggressively hawkish philosophy, and is a bit of an intellectual bully besides. Thus begins... I'm not sure, actually. Darkest Hour noticeably lacks any such gauche affectations as "a clear narrative arc"; it's basically the story of how everybody hated Winston, and he stuck to his guns, and gave a great speech, but everybody still hated him, and then he stuck his guns some more, and gave another great speech, and everybody loved him. Compared to The King's Speech, which had a very clear conflict, dramatic shape, and clearly articulated end goal, Darkest Hour is much more of a psychological free-for-all, with Churchill attempting to battle his own doubts while also proving himself to everybody in the government. And there's something kind of exciting about that, though the film's insights remain strictly surface level and monotonous, familiar not just from The King's Speech, but from damn near every one of the I-don't-know-how-many films centering on Churchill as a larger-than-life inspirational orator and hungry wartime leader. If anything comes close to justifying Darkest Hour, it's that this is the latest film directed by Joe Wright, a filmmaker I have never particularly cottoned to, but whose strengths are well-suited to make a saving throw here. He's a technical show-off and a lover of theatrical staging, and both of those are worked well in this film, which starts off by using an ornate overhead shot of Parliament to usher us into the busy halls of government as a combination ant hive and theater in the round. The film doesn't quite sustain this; every now and then, Wright pulls another florid camera movement out of his sleeve, and gives the film a little bit of juice, but these are few enough in number that they stand out less as moments of emphasis, than as deviations so conspicuous that they raise the question of, if the film can be doing that always, why isn't it doing it more often. Thanks to the painterly efforts of Bruno Delbonnel, Darkest Hour is always beautiful - the most beautiful film sitting anywhere near the Oscar race, maybe. But it's somewhat empty beauty, and awfully clichéd; you will be amazed when I tell you that there are shafts of light pouring into dusty, dim rooms, all throughout Parliament. The other justification, of course, is the Bravura Turn of Legendary Actor Gary Oldman, and I'm frankly not certain that he justifies a solitary goddamn thing. The Churchill of the popular imagination is a big, jowly cartoon, spitting out witty teardowns and roaring his way like a bull through anybody who might want a little bit of nuance with their fire-breathing wartime patriotism. Oldman leans into that cartoon without hesitation; he slurs, he wobbles his face, he races from jovial humor to spitting acid in the space of about three frames. It's certainly memorable and fun, particularly compared to Cox's weird, unpleasant version of the character in Churchill. But a big ol' slice of ham is merely enough to make the film mildly comic, not to give it any weight as a story about the United Kingdom in the early years of the war, and definitely not enough to lend anything resembling new insight into Churchill, a character that the film happily presents as just a whirlwind of passions about kicking the Nazis back to Germany, without any other hint of depth or complexity. The lack of insight is unsurprising; McCarten's last film was the similarly surface-level-only biopic The Theory of Everything, and Darkest Hour is at least a smidgen better than that: it looks more interesting, and Oldman's corny performance is silly enough to keep it from being such a tacky dive into sentiment (Darkest Hour limits its sentiment to one horrendous scene on the London Underground, where Churchill picks up the refrain of his "we will fight them on the beaches" speech from a charming little girlchild, after having chatted about the indefatigable English spirit with the starry-eyed commuters). But it's no smarter, and it wastes better material and a stronger cast (Kristin Scott Thomas is on hand to play Churchill's wife Clementine with a stern warmth that makes me desperately wish this was her movie, instead of a movie where she gets a few largely disposable scenes). Wright's inconsistent sense of theatricality aside, this is just one more in the never-ending cycle of British prestige biopics, interesting solely because of their lead performance, and impossible to remember in more than vague details within hours of ending. It's not quite as violently tedious as 2017's other Churchill biopic, but Darkest Hour has very little to recommend it, and a smudgy center that makes it mostly just boring as hell in-between the bits where Oldman says something famous.